Investors rejoiced and the markets rallied, with the Dow rising above 8000 points and capping “the best four-week rally since the week ending May 12, 1933.” Bulls can now retort that the stock market bust of 1929 took four years to recover, while the recession of 2008-2009 required less than one year. Forex markets also reacted “positively” to the G20 summit, lifting the Dollar above the important psychological barrier of 100 Yen/USD, and causing emerging market currencies to rise across the board. Monday, however marked a return to business as usual: “Post-G20 euphoria, which had helped to boost market confidence about a global recovery, proved short-lived as investors once again focused on the continued risks to the banking system.” It was probably only a matter of time before investors drilled beneath the surface of the impressive-sounding G20 rhetoric and large numbers, into the nuts and bolts of the summit’s policy prescriptions. [The chart below comes courtesy of the New York Times]. The headline-grabbing $1.1 Trillion figure, for example, is somewhat misleading. 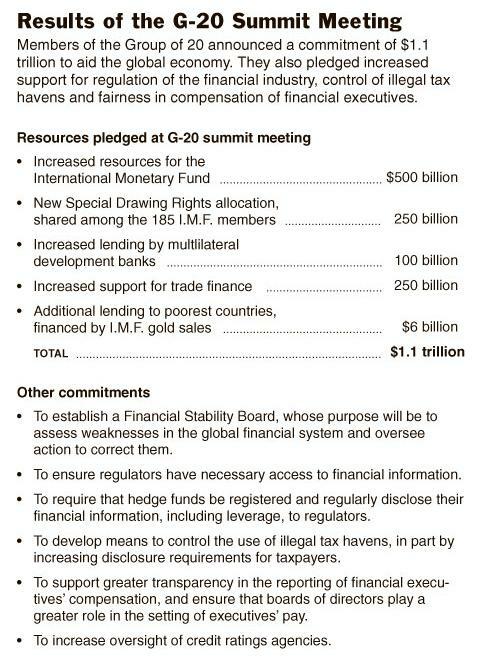 Over half of the $500 Billion “pledged” to the International Monetary Fund has either not been raised or not been explicitly authorized. Then, there is $350 Billion in trade credit, most of which is either redundant or double-counted, since “trade financing is rolled over every six months as exporters get paid for their goods and repay the agencies that lent them the money.” The remaining $250 Billion is accounted for in the issuance of IMF synthetic currency to member nations. However, given that the synthetic currency derives a significant portion of its value from the Dollar and Euro, this program cannot be effective if the US and EU opt out, of which there is a real possibility. The summit also failed to meaningfully address concerns of the continued ole of the USD as the world’s de facto reserve currency. The expansion of the IMF synthetic currency program represents an important starting point, but at this point, it looks like China and the other supporters of an alternative system will have to wait for the next G20 meeting, to be held in September. A form of credit is given by the exporter to the importer, goods are shipped. After 6 months the importer pays the exporter for the goods. Then the exporter pays various agencies that lent them money. Who is the exporter paying? This might make sense to me IF the “agency” is also the importer. The importer lends money to the exporter to produce goods, then the exporter makes and ships the goods and gives the importer credit to pay them back for the goods at a later date. Then the importer pays the exporter for said goods and the exporter pays the “agency” which also happens to be the importer. And because this money is paid back every 6 months, the same money that was paid to the exporter will be given right back again to repeat the cycle. I would like some more detail on this if you can, I suspect my example above is entirely incorrect. What is needed is a major overhaul of IMF. Most of the poor countries are heavily in debt and have been hit hard by the recent financial crisis. You are right let’s wait for the London G20 meeting.